Friendly piney citrus resonation sweetened by pale malt sugaring and tart lemondrop tingle for commonplace moderation. Grapefruit-peeled orange rind bittering contrasts spicy peach, pineapple and mango tropicalia. Serve to deserving proletariats. 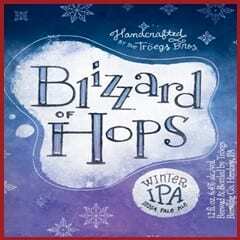 Wintry IPA ups the tropical fruit spicing and lowers the piney hop resonance for ‘end of year hop cycle’ celebration. Lovely floral-perfumed grapefruit, orange, pineapple and peach tang gains ancillary mango-nectarine-tangerine conflux and dry wood tone above mild biscuit base. More like a “gentle spree of hops” and that ain’t a putdown for this relaxingly accessible moderation. On tap at Biggie’s, floral-fruited summertime moderation eases sharp-tongued orange peel and grapefruit rind bittering into soft-throated hibiscus flowering and mildly creamed sugared malt spicing. Mild piney hop resin and dank herbal nuances seep into mannered tropical mango-papaya-guava-cherry tang after initial clean-watered citric intrigue. On tap at Taphouse 15, tart Balaton cherry juicing brings sour edge to sweet chocolate syruping, vanilla extract adjunct and oats-dried backbone, forging a sanguine Cherry Cordial warmth. Smoked mocha smidge hits mid-palate, alongside dewy tobacco roast, adding underlying acridity to sour ‘n sweet cherry pie finish. On tap at Biggie’s, mighty fine high octane 2017 (11% ABV) version of Christmastime Belgian dark ale boasts heightened ethanol esters, darker rub red hue and intensified Bing cherry essence as well as more refined wildflower-honeyed astringency. Distant cinnamon, clove and allspice seasoning sweetens treacly backend alongside sugarplum, cocoa and pine nut nuances. On tap at Taphouse 15, welcoming hybridized Belgian Dark Ale (sans “cherries and honey” of original Christmastime elixir) retains syrupy dark fruiting and candi-sugared Vienna malt spine. Sugar plum, fig, date and raisin illusions pick up sinewy orange-bruised liqueur warmth. Just a tad dryer and less complex than Troegs Mad Elf. Brisk pink grapefruit-juiced mango tang gains sour lemon rind pungency and downplayed piney hop bittering above crystal pale malting. Herbal chamomile influence and ancillary orange-peeled guava, pineapple, tangerine and cantaloupe illusions support bittersweet mango tango. On tap at Growler & Gill, velvety nitrogenated milk stout brings delightful Hershey’s dark chocolate syruping to cocoa-spiced vanilla adjunct above barley-roasted oats spine. Mildly creamed chocolate sweetness delicately caresses soft-watered pleasantry. Durable Belgian-styled dubbel drizzles brown-sugared raisin, fig and sugarplum conflux and molasses-candied chocolate malting atop sharply spiced peppery hop herbage. Bruised apple, brown pear, toffee, cocoa and dried cherry illusions sweeten its back end. 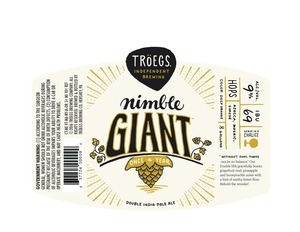 On tap at Poor Henry’s, ‘nimble giant’ is just that! Guileless lemon-peeled yellow grapefruit tang brings zesty fruit juicing to moderately bitter piney hop resin and sweet crystal malting of spry medium body. Floral wisp serenades ancillary mango, pineapple, passionfruit, papaya, peach and tangerine tropicalia.